In the 1868 General Election, Samuel Plimsoll was elected as MP for Derby. He immediately began to campaign for government legislation to protect seamen. To support his case he published Our Seamen (1873), a book that provided documentary evidence about the scale of the problem. This included information that nearly 1,000 sailors a year were being drowned on ships around British shores. As part of his campaign, a copy of Our Seamen was given to every member of the House of Commons. Samuel Plimsoll was particularly critical of the 1871 Merchant Shipping Act. As a result of this legislation seamen were obliged, subject to imprisonment and fine, to go to sea and complete a voyage once they had signed a contract. This made it difficult for sailors to leave a ship once they realised it was unseaworthy. In March 1873, The Times joined Plimsoll's campaign by printing a story about fifteen seamen who had been imprisoned for three months after they refused to go on board the ship Peru. When the ship finally left Cardiff with a new crew, it sunk in the Bay of Biscay and three men were drowned. Polly: "O, Dear Jack! I can't help crying, but I'm so happy to think you're not going in one of those dreadful ships!" 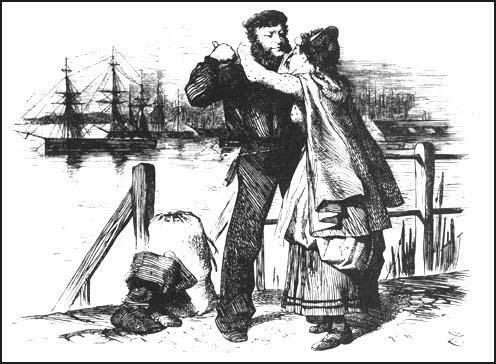 Jack: "No, No, lass - never more - thanks to our friend Master Plimsoll, God bless him."